This is the final entry in a six part series brought to you by Healthy Blue LivingSM, a highly successful health care plan that rewards people who commit to making better health choices by focusing on six high-impact measures of health. Healthy Blue Living is celebrating its Fifth Anniversary by inviting YOU to make a pledge and tell us what you will do over the next five years to improve your health. “Blood sugar concentration” (also known as the blood glucose level) refers to the amount of glucose (sugar) present in your blood. Glucose is the primary source of energy for the body’s cells, and is made available for absorption via the hormone insulin. Insulin is necessary for the body to be able to use glucose for energy. When you eat food, the body breaks down all of the sugars and starches into glucose, which is the basic fuel for the cells in the body. Insulin takes the sugar from the blood into the cells. 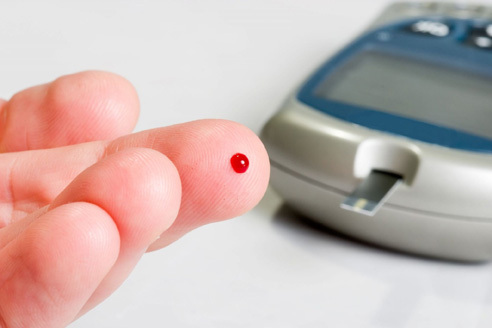 When glucose builds up in the blood instead of going into cells, it can lead to diabetes complications. Type 1 diabetes is usually diagnosed in children and young adults, and was previously known as juvenile diabetes. In type 1 diabetes, the body does not produce insulin. Type 2 diabetes is the most common form of diabetes. Millions of Americans have been diagnosed with type 2 diabetes, and many more are unaware they are at high risk. In type 2 diabetes, either the body does not produce enough insulin or the cells ignore the insulin. Before people develop type 2 diabetes, they almost always have “prediabetes” — blood glucose levels that are higher than normal but not yet high enough to be diagnosed as diabetes. There are 79 million people in the United States who have prediabetes. Recent research has shown that some long-term damage to the body, especially the heart and circulatory system, may already be occurring during prediabetes. The blood glucose levels measured after these tests determine whether you have a normal metabolism, or whether you have prediabetes or diabetes. If you are diagnosed with prediabetes or diabetes, talk to your healthcare professional about ways to keep your blood sugar levels under control. You can prevent or delay the onset of type 2 diabetes through a healthy lifestyle by changing your diet, increasing your level of physical activity and maintaining a healthy weight. With these positive steps, you can stay healthier longer and reduce your risk of diabetes. Healthy Blue Living members need to work with their doctor to keep their blood sugar at normal levels (fasting blood sugar or A1C) to earn the enhanced benefit level with lower out-of-pocket costs. Blood sugar medical information used in this blog post came from the National Heart, Lung, and Blood Institute (NHLBI) and diabetes.org.